Welcome back Jay-Squad. 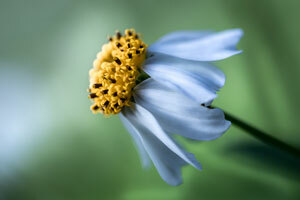 Today we are going to turn this flower photo... into this photo using Lightroom. So let's get started. The first thing I always do is go to is the "Lens Corrections" panel to turn on the lens corrections. You can see that it already has my lens detected but you can manually select your lens if you need. Next, I'll go up to the "Basic" panel and change my "Temp". I typically like my photos on the colder / bluer side. If you click once on the work "Temp" and wait a sec, it will make that the default so you can use your keypad. So now, that it's my default, I'm going to use the minus key to bring down the temp in increments of 50. This is much easier than trying to deal with the slider. I'll set that to 3850. Here's a before and after. You can see the difference mostly in the green but also the white leaves. Next, I'm going to change the "Tint" to plus 27. Next, I'm going to raise the shadows up to about plus 10. Then, I'm going to raise the "Whites" up to plus 40. Next, I'm going to bring down the blacks to minus 18. Next, I'm going to increase the "Clarity" slightly to plus 17. And here is a look of the before and after. Looking much better but let's keep going. Now I'm going to skip down to the "HSL" panel to the "Luminance" and increase the yellow to plus 100 and increase the orange to plus 24 to brighten up the flower. I'll turn on and off the panel so you can see the difference. Moving down to the "Effects" panel, I'm going to add minus 12 vignetting. And that does it for the basic editing. Here's the before and after. Ok, we are not done. Now comes the fun stuff! Up at the top are the "Graduated Filters". The first one I used is the "Radial Filter". I set the exposure to plus . 67. I've already added it so I'll turn it on. Here you can see I use it to brighten this area. And, final step that I do with my photos is the "Adjustment Brush". I'll turn it on and off so you can see. This is my favorite adjustment to because it feels like your painting. I use this to dramatize the hightlights and shadows of whatever I want. I'll hover over the first one which I use for the highlighting. You can see that I have it set to plus .67. And then I just click and brush in what I want to brighten up. Like this. I'll hover over so you can see the areas I did. I do the same thing with this one but to darken the areas. I have this set to minus . 67. And I'll hover over so you can see what I brushed. And with that, this photo is completed. I hope this was helpful for you seeing how I edit my flower photos. Let me know if you liked this tutorial. Thanks for watching!